I spent the weeks right before and after the new year celebrations telling people I don’t make New Year’s resolutions. Why? I’ve found that I’m better at sticking to short-term goals, and they give me a more realistic time frame and a way to measure my success at reaching those goals that I’m comfortable with. However, I did something unusual last week: I realised I do have a goal that I’d like to work on for all of 2015. This goal is kind of like a way-of-life change, because it doesn’t have an end date, and I won’t stop doing it and start doing something else once I’ve reached this goal. In fact, it’s not even something to reach. That’s why I like it. 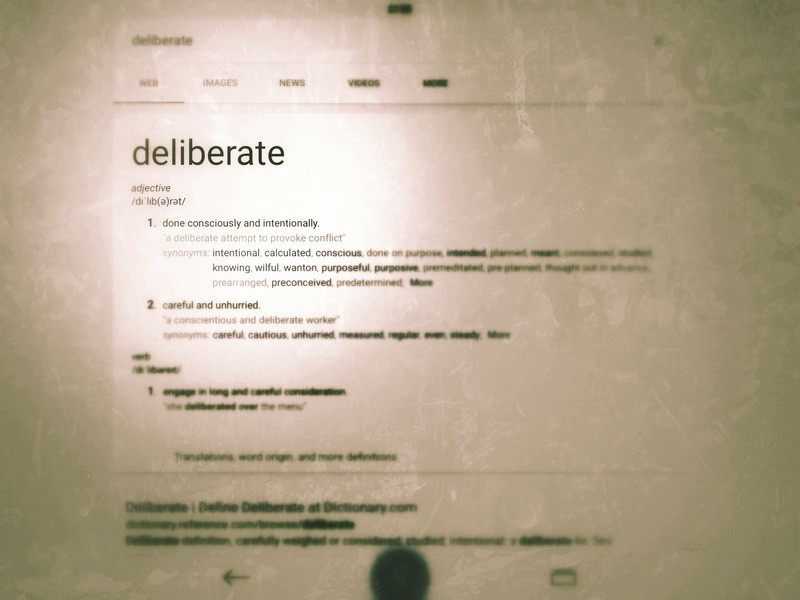 My goal: I commit to try and be deliberate in my actions. What the heck does that mean? I’ve thought a lot about how I want to live my life, how best to approach the world and respond to it, and about my own personal character traits. I’d like to say that I deliberately choose to spend half the night staring into a small back-lit screen browsing photos and videos and articles instead of sleeping. I’d like to say that I don’t deliberately choose to spend my days off doing the perfect combination of relaxing and being productive. I’d like to say I do a lot of things differently than I do. But I don’t like that kind of negative, wistful “should have but didn’t” thinking. So instead, I’m making a change. Going forward, I will own my actions. Even the lazy, unproductive, boring ones. I’m making a choice to own my actions, and be deliberate about what I do. I know that I don’t have control over everything, and that sometimes I’ll spend my time doing one thing and then wish I had done it differently, so my commitment is to try. To make an effort. I’m not saying that I will do everything perfectly, or that I won’t make mistakes–I’m saying that I’ll take ownership of whatever it is that I say and do. And by making this commitment, I’ll also learn a lot about who I am, why I do what I do, and I’ll be more mindful of my actions and decisions. I look forward to being able to post here a year from now that I have spent a year being deliberate.